Is this the ultimate prize for our foodie fans? 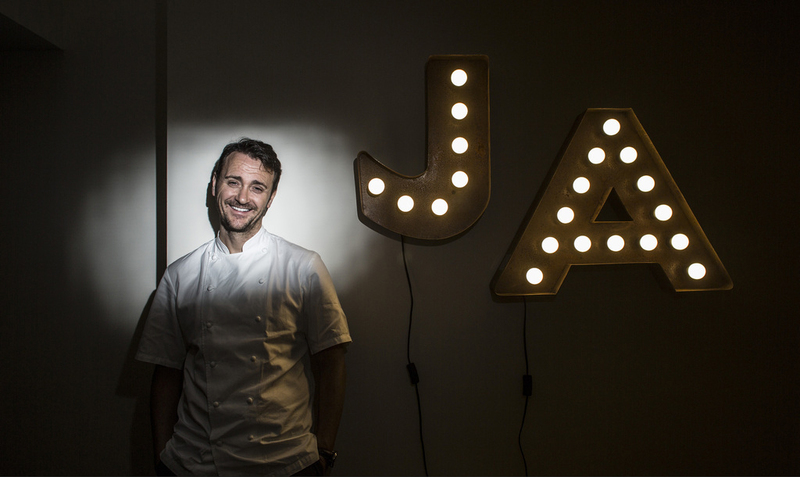 You could have Jason Atherton cook a full tasting menu in your very own home, for you and 11 friends. You might already know him from the Great British Menu, but on 10th October you’ll know him as your personal chef. • This prize draw is open to all UK residents aged 18 or over (except for anyone directly connected with the planning or administration of this “Win your own Michelin-starred dinner party” prize draw) who have completed the draw Shortstack entry form. • Prize Details: There is one prize of a full tasting menu cooked by Jason Atherton for the winner and up to 11 guests cooked at premises provided by the winner. • The closing date and time for entries into the LRF prize draw is 23.59 on 31/08/2014 2014. Entries submitted after this date and time will not be included in the prize draw. • The winner of the prize will be contacted within 5 days of the draw and will need to be able to provide an available kitchen in order for the tasting menu to be prepared. • The winner must be available for the entire day on 10/10/2014. Access for Jason Atherton and his team will be required from 3PM on the day of the prize. Access will also be required the day before, on 09/10/14 to deliver the ingredients for the meal and chilled storage will be required for this. • If the kitchen is not located on the winner’s property, they must provide proof of permission to us the kitchen in question. • If the winner cannot be contacted or does not respond within 5 days of the initial notification, or cannot take up the prize, then we reserve the right to select another winner. • We have organised this prize draw in good faith but cannot accept any liability relating to the prize draw or the prize offered. • Winners will be required to take part in marketing events. Such marketing may include filming of the winner and their guests, and both the exterior and interior of the property in which the winner chooses to host the prize. Such film will be for use at Ocado’s discretion. • The promoter of this prize draw is Ocado Limited. For details of the winner’s name and county please send a SAE to the Marketing Department, Ocado Limited, Titan Court, 3 Bishops Square, Hatfield Business Park, Hatfield, Hertfordshire AL10 9NE. This entry was posted in Competitions and Prize Draws, Talking Ocado and tagged American Express, competition, Cooking, cooking from scratch, enter now, food, foodie, full tasting menu, good food, Groceries, home cooking, Jason Atherton, London Restaurant Festival, Ocado, Ocado deliveries, ocado.com, Shopping at Ocado, Win by Ocado. Bookmark the permalink. with or sending email to and help ensure their safety. into, it’s just a matter of time until the rest are. If you wish to have a strong password, have at least 10 characters. to give users an option to unlock their phones using a fingerprint, and something the person knows. A 2 lettered password, for instance, has just 676 arrangements. It’s extremely really helpful to seize the chance without fail. etc). You can get email transcripts as well, if he uses email on his phone. approach? I have a undertaking that I am simply now working on, and I have been on the glance out for such information.